Stena Line is start live tests of battery power on one of its ferries, the Stena Jutlandica, which operates between Gothenburg and Frederikshavn. In the first stage, the electric motors will be used for manoeuvring in port, but ultimately it hopes that batteries will have a range of 50 nautical miles. “As both the size and cost of batteries decrease, battery operation becomes a very exciting alternative to traditional fuels for shipping, as emissions to air can be completely eliminated,” said chief executive Niclas Mårtensson. Stena has signed a contract with Callenberg Technology Group for batteries with a capacity of 1 MWh to be installed on Stena Jutlandica. In step one of the tests, battery power will be used for bow thrusters and manoeuvring when berthing in port. In step two, an extended battery operation is connected to the propellers, meaning that Stena Jutlandica can be operated on electricity within around ten nautical miles, equal to the distance between Gothenburg and Vinga Lighthouse. In step three, battery capacity is further expanded and a vessel can operate about 50 nautical miles of electricity corresponding to the distance between Gothenburg and Frederikshavn. The technology tested is based on plug-in hybrid technology. 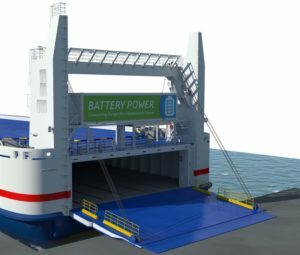 The batteries are charged when the ship is connected to shore power, which is also an important focus area on clean energy, but can also be charged while operating the ship’s generators.